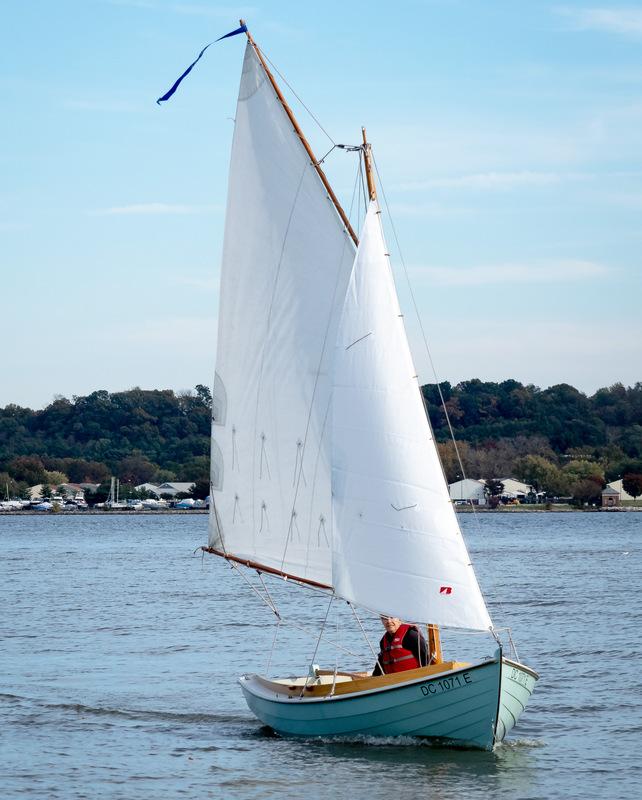 There she was, Miss April in the 2015 Calendar of Wooden Boats. Benjamin Mendlowitz had photographed her at the golden hour, at anchor, with the water around her ever so slightly rippling. That was the first time I saw BELLE. After 35 years of racing on Chesapeake Bay, I was looking to downsize from my 26′ racing and cruising sloop. My crew had grown older, and none of us were willing to do the foredeck duties while careening around the marks. I was looking for something a bit more manageable for one or two people. I always liked the lines of some classic gaff-rigged daysailers such as the Herreshoff 12-1/2 and its relatives, but I wanted something that was lighter and trailerable. At 16′— and with those looks—BELLE seemed to fit the bill. 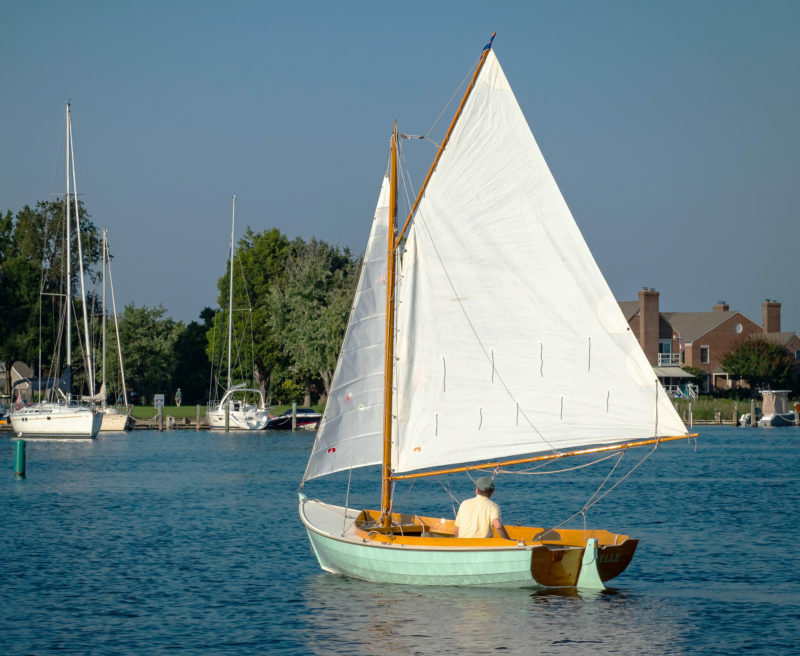 After I saw the photograph in the calendar, I searched up BELLE and found that Dan Gonneau, the designer/builder, had written a blog post that was a stream-of-consciousness diary about his inspiration for exactly the kind of small boat I was looking for. 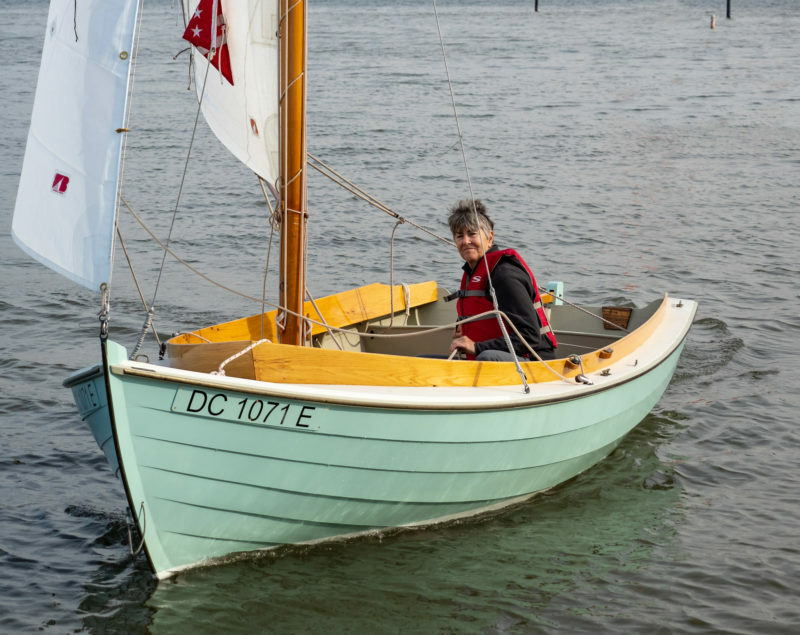 It sketched out the big decisions, the tiny details, and the material choices that went into the boat, and the craftsmanship that infused her every plank, frame, and joint. Classic lines with a modern aesthetic—I was hooked! The removable rowing thwart is shown here in place, spanning the centerboard trunk. A bulkhead just forward of the transom serves as a backrest and creates an out-of-the-way space for stowing an outboard. The 8′-long cockpit and berth-wide benches offer, with the addition of a boom tent, overnight accommodations. 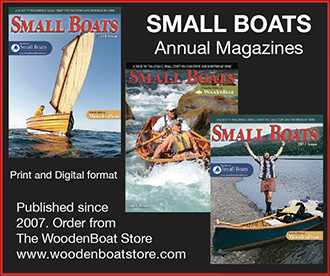 Dan was working as a boat carpenter by day and thinking about his ideal small boat by night. Over the course of about two years at the D.N. 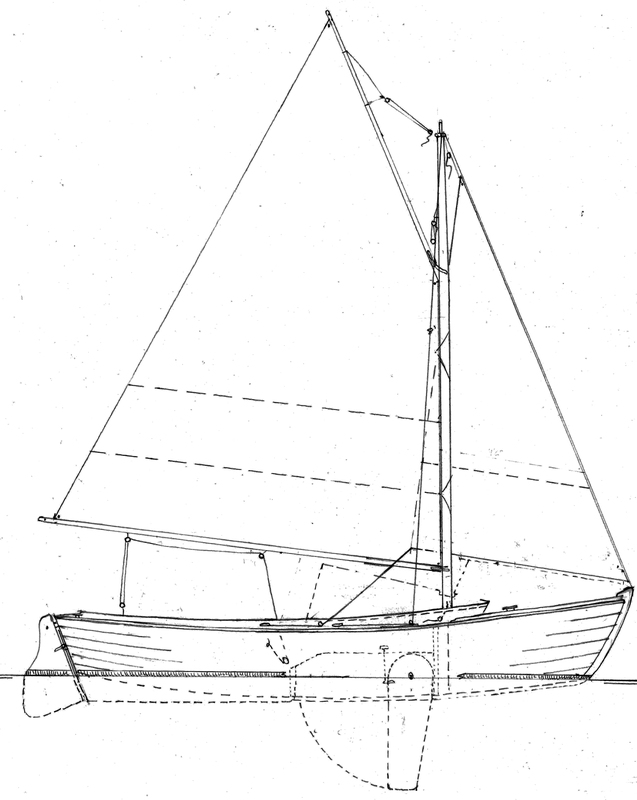 Hylan yard (now named Hylan and Brown Boatbuilders) in Brooklin, Maine, Dan put pencil to paper—no CAD here!—and BELLE took shape. It wasn’t his first construction, but I think it’s his best. His forethought shows in many ways. The cockpit, for instance, has 8’-long seats with usable storage space underneath, and the centerboard trunk is unobtrusive. The cockpit is functional but not cluttered, with everything you need and nothing you don’t. I’ve sailed with four adults on board and the boat performs well, maybe even better than when solo, and there’s still plenty of room and comfort. And a soft-sided cooler fits perfectly behind the trunk. The steambent coamings give the boat a classic look and are set at an angle that provides a comfortable backrest. Our BELLE, the first built to the design, has an attractive color scheme—light blue/green hull and an off-white Dynel deck. The interior has weathered Port Orford cedar floorboards and trunk cap with everything else painted gray-green. By limiting the brightwork to her red oak coamings, cypress/western red cedar cockpit seats, Douglas-fir spars, and not much else, the emphasis is on the boat’s clean, simple lines. It also means not too much varnishing in the spring.. BELLE’s whole is indeed more than the sum of her parts. The boat and trailer fit in the garage during the off-season, with a full 3/4″ to spare! Its size means that you’re closer to the water— literally and figuratively. One of my first sails was in the fall and was a magnificent introduction to the pleasure of a small boat. I was gliding through flat water in a little creek where most trees had shed their leaves. As BELLE parted the patches of fallen leaves now grouped on the water, I could hear the slight rustle as they brushed against the underside of the lapstrake hull. Now that is getting back to nature and close to the environment, which is what I think of as the essence of small-boat sailing. My wife, who is a self-described “happy passenger” on the 26-footer, has become enamored of BELLE; she finds it more inviting, less intimidating. The controls are within easy reach and are more easily managed. And while BELLE is sensitive to weight shifts, the 126 sq ft of sail, 6′4″ beam, and low center of gravity steady her well. Rigging the boat is pretty straightforward. The 15′11″ mast is of hollow bird’s-mouth construction and weighs less than 20 lbs, so lifting it into the deck partners and setting it on the step presents no major difficulties. All halyards are cleated to the mast, which simplifies rigging. A wire forestay and two Dyneema side stays connect in less than a few minutes, and the mast is ready to accept the boom, gaff, and mainsail. The jibsheet jam cleats are set on chocks secured to the coaming. BELLE is a beauty to sail. Unballasted and weighing only about 550 lbs, she flies off the wind. And downwind, wing-and-wing, with the centerboard raised, she is a positive demon. Upwind, it’s been a learning experience for this old marconi-rig helmsman. The main has a relatively high peak and it seems sensitive to peak halyard tension. However, I’ve found that if I bring the peak up so that the leech is straight and then back off just a bit, BELLE exhibits good performance into the breeze. To help things further, I put a little bit of a foil shape on the centerboard which had originally been a flat panel made of two layers of 3/8″ plywood, rounded along both ends. I think the smoother flow helps her get a better bite to windward. And since she’s now on a trailer, I’ve replaced the bottom paint with a smooth enamel, which I’m sure gives her an all-around boost in performance. BELLE’s broad garboards have no deadrise amidships, and that flat surface makes the boat easy to load on a trailer and should be good for pulling the boat up a beach on rollers (though I have yet to try that). It does contribute to a bit of slap on the bottom going upwind in a chop, but with a bit of heel the boat will cut through the water more like a V-shaped hull. The gaff sloop rig carries 92 sq ft of sail in the main and 32 sq ft in the jib. BELLE has watertight compartments fore and aft. The bow compartment, occupying the space below the foredeck, is designed so that the bottom of the mast can fit snugly in the boat when trailering with the top nestled in the sculling notch in the transom. The boom and gaff fit securely on the cockpit floor. Beneath the seats there is ample storage space for fenders, lines, and gear. The storage isn’t waterproof—what can drain out through a limber can also come back in—but it’s very handy. To keep things dry, I use small gear hammocks under the foredeck. The sculling notch in the transom, for those so disposed, is set off to starboard. The oarlocks are set in chocks on the coaming, and with the wide beam and high placement of the locks, 10’ oars would be required. Unfortunately, the ramp and dock I’m now using are not really amenable to such long oars and it can get a bit congested, especially when the two college sailing teams hit the water. So, I’m using paddles for maneuvering around the docks, which works pretty well for short distances. A wire forestay and a pair of Dyneema side stays support the mast. For longer distances, I need auxiliary propulsion. Fortunately, between the end of the cockpit and the transom (above the aft watertight compartment) is an open space designed to store a small outboard motor. Initially I thought that a 2– to 3-hp gas outboard would be about right, but further reflection on having a gas can aboard, combined with the smell and noise, brought me around to trying an electric trolling motor. The boat is actually designed with space and weight allowance for a battery under the foredeck, forward of the mast. I installed a 35-amp deep-cycle, lead-acid battery and used about 15′ of 8-gauge wire under the side decks with a master switch, quick disconnects on the battery end, and a heavy-duty connector to the motor. The motor is rated at 46 lbs thrust and moves the boat quite well at about three-quarters throttle. I can get just shy of 4 knots at full throttle. According to the motor’s manual, I should get about 45 minutes at full throttle and 2 hours or so at half throttle. This arrangement has worked well for a year. If I need more range, there is space for a second battery. One unexpected benefit is the tranquility that comes from nearly noiseless propulsion. You can almost forget that you’re under power. BELLE attracts more than her share of acknowledgments on the water, on the trailer, and even in the garage. When you receive compliments from an admiring kayaker or fisherman, sailing a beautiful boat brings more benefits than just the satisfaction of wind and water. Tom Sliter has been racing and cruising sailboats on the Chesapeake Bay and environs for the past 45 years. He insists that it’s the one thing that helped him retain his sanity during 35 years working on Capitol Hill. 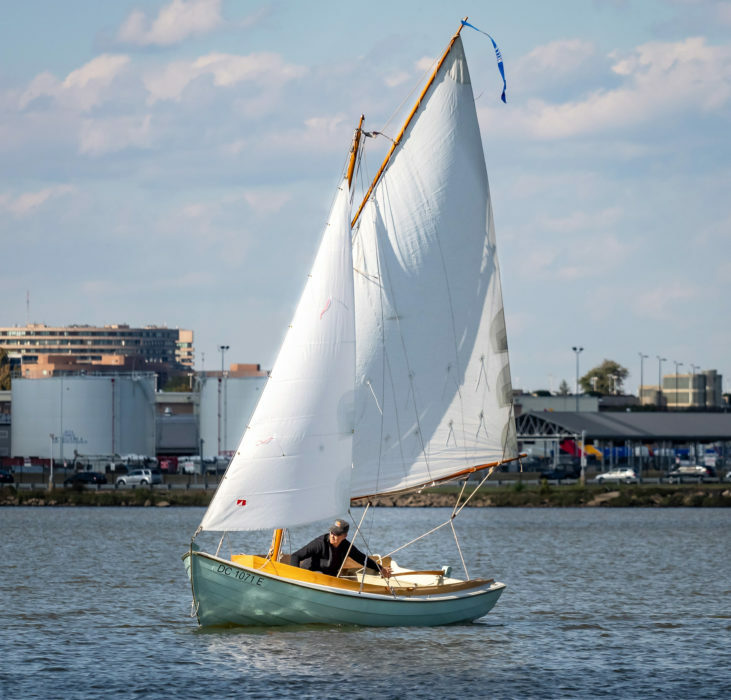 These days, Tom teaches sailing with DC Sail and is also a US Sailing race officer. His non-nautical time is spent as a member of a local fine art photography gallery. Tom’s wife Debbie notes that with BELLE around, the usual springtime scent of mulch in the garden has been replaced with the bouquet of varnish. 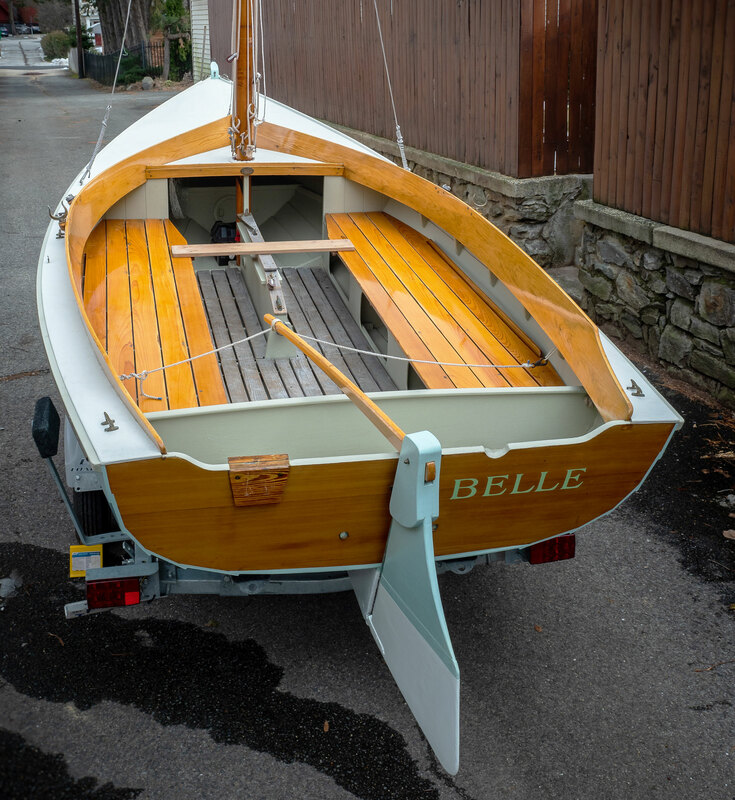 The Belle is available as a finished boat from Belle Boats, Shelter Island Heights, New York. Prices begin at $31,900. Very pretty boat!. 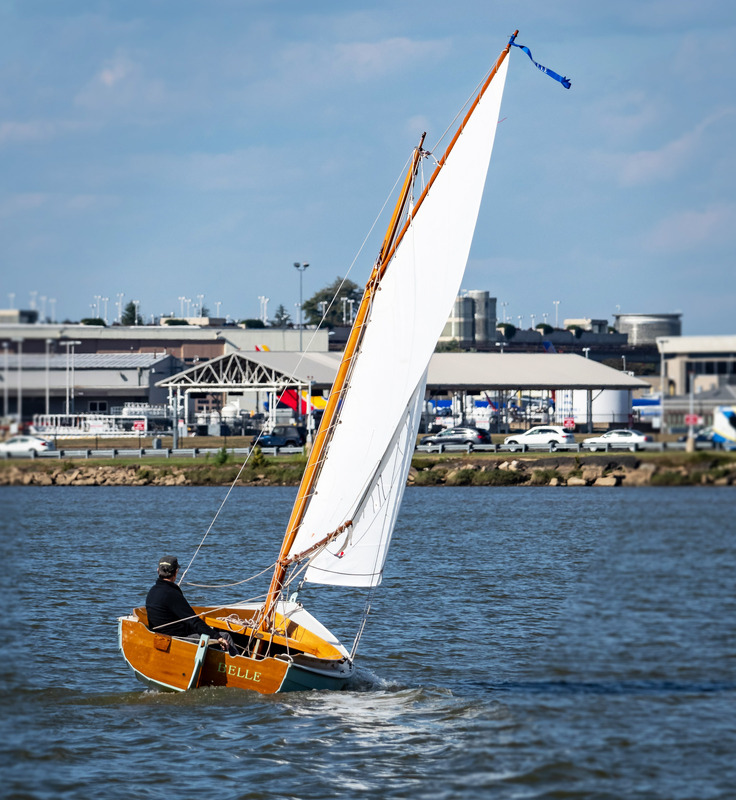 One serious advantage of the jib in a small boat is that if you leave it hauled to windward for just a moment, it will drive the bow through the eye of the wind. That is lovely gaff main!! Wonderful article! I very much enjoyed Tom’s descriptions and the video of the boat in action is always a terrific accompaniment to Small Boat Monthly articles. Thank you. Beautiful boat! Well written story of its design and function. Enjoy.